It’s not easy to water your lawn. Between figuring out what the weather is going to do, remembering which part of your yard gets more sun, and trying to adhere to any water restrictions, there’s just so much to think about. That’s why we researched the best wifi sprinkler controllers. These handy gadgets can do most of the hard work for you. Before we get into our smart sprinkler controller comparison, let’s look at some essential features. Zones: This is really based on how big your yard is. With a lot of the products in our wifi irrigation controller review, you can divide it up into smaller sections and have a different watering schedule for each one. Smartphone Ready: What good would a high tech device like a wifi sprinkler be if you couldn’t connect it to your smartphone? All of our top picks have apps that you can use to monitor and make adjustments to your sprinkler system. EPA Certified: EPA Certified sprinkler controllers meet the agency’s WaterSense standards. This basically means that they can do their job without over-watering and being wasteful. They also have a system in place to tailor the watering to the plants’ needs. Battery Powered: Most of these products are not battery powered because they wire directly into the circuitry for your sprinkler system. So, that’s where they get their power from. And, believe it or not, we even found one that’s solar powered. Weather Aware: This is a really cool feature that most of our picks have. They can actually get the local weather forecast and adjust your watering schedule accordingly. You’ll never water your grass right before a rainstorm again. Size: This is the size of the mounted control panel. It’s important to keep this in mind because, even though you’ll likely be doing most of the adjustments and monitoring remotely, you will need to install a central panel. Now that we covered some important features in our wifi sprinkler controller buying guide, let’s move right into our wifi sprinkler controller reviews. Here’s the deal. Our top and budget picks are first and the best place to start, especially if you’re running short on time. They give you a good idea of what’s out there. All of the products in our wifi sprinkler controller review are awesome, though, so stick around if you can! Ok, let’s get started. 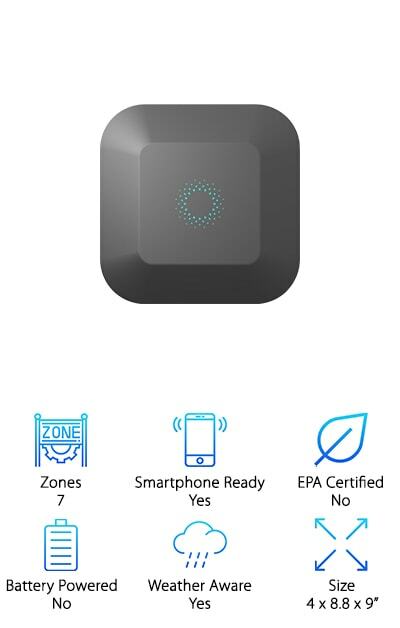 Our top pick for best smart irrigation controller comes from Rachio and it’s pretty awesome. The thing we like the most about it is that you can control it with Alexa just by using your voice. No worries if you don’t have one, though, you can also download the app to manage your sprinklers from your smartphone, tablet, or laptop. Another really awesome thing about it is it pays attention to the local weather forecast. Why does this matter? The system will automatically skip a scheduled watering if rain is in the forecast. This will save you water and lower your bill. You can customize it to your yard, too, by telling it what kind of soils and plants are in certain areas and how much sunlight each gets. If you’re looking for the best sprinkler system controller on a budget, check out this one from Orbit. We love that the app works with Android, iOS, and web devices so you can use it no matter which system you prefer. Something else that’s really useful about it is you can set the timer for when you want it to start or you can rely on the weather-based software to make a schedule for you. If you want to make sure you’re getting the right amount of water to all of your plants, this system allows you to adjust the amount of water according to plant type. Installation is really easy, too. The time even comes in a weather-proof case for you can mount it indoors or outdoors. This RainMachine Touch Irrigation Controller is easy to install and has a lot of really awesome features. 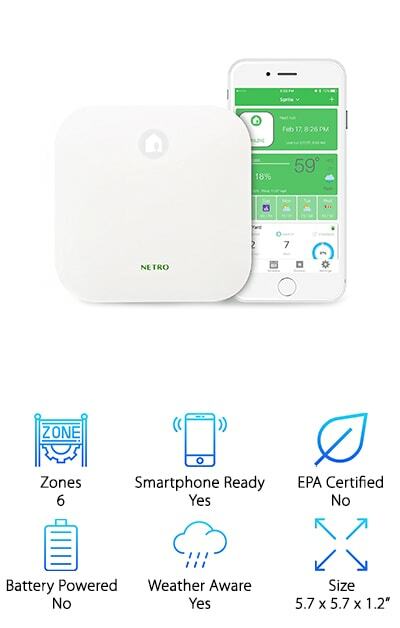 For starters, it’s compatible with different devices and services like Alexa, Nest, and WINK. But, if you want to use your smartphone or PC to access the controls, you can! And here’s the best part, you can do it from anywhere, whether you’re at work or away on vacation. If you’re at home, just use the bright 6.5 inch touchscreen to control it. By using a local weather forecast, this controller can make daily adjustments. That means your lawn gets exactly what it needs and you have to worry about over-watering or wasting anything. This best wifi irrigation controller actually downloads weather data every 6 hours so you can believe it’s extremely accurate. Another one of our picks for best sprinkler controller is from Rain Bird. The controls are really easy to use and you can access it right from the palm of your hand by using the convenient smartphone app. What’s great about these apps is you can make changes from anywhere. This one has a really great automatic schedule that will adjust itself based on the season, temperature, humidity, and local forecast. This saves water because it’s only giving your lawn what it needs. Your lawn will thank you for it with greener results. Plus, you’ll get notifications sent to your phone through the app about what’s going on in your yard. Installation is really easy, too. It uses the same wiring as any standard timer. 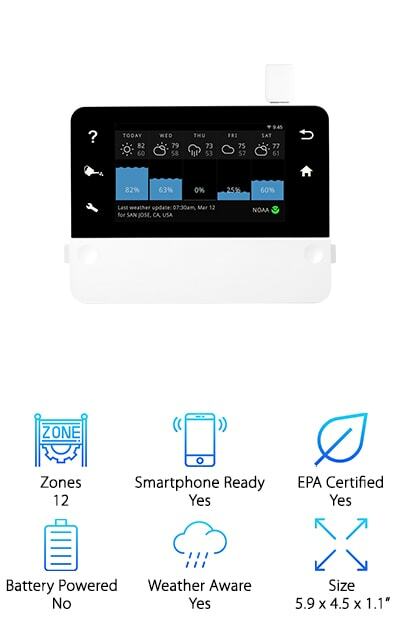 There are a lot of things to love about our next choice for best wifi sprinkler controller from SkyDrop. For one, you can monitor and manage your sprinklers so many ways. Use your computer, smartphone, tablet, or even a text message. 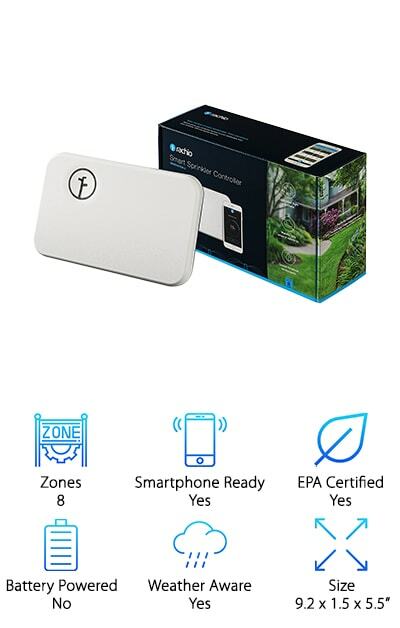 This allows you to be in control even when you’re not at home. SkyDrop uses hyper-local weather data to make sure that every zone in your yard gets the right amount of water. You provide specific information about each zone, like the type of plants, amount of sunlight it, and even the slope. 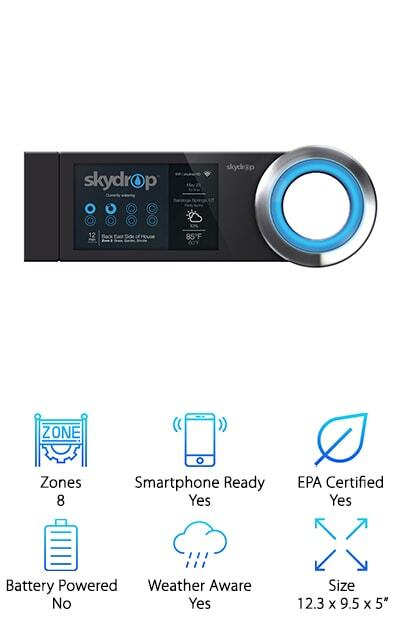 SkyDrop uses science and special calculations to make sure each zone gets the perfect amount of water. And get this. If you live in an area where there are water restrictions, it factors that into your watering schedule. 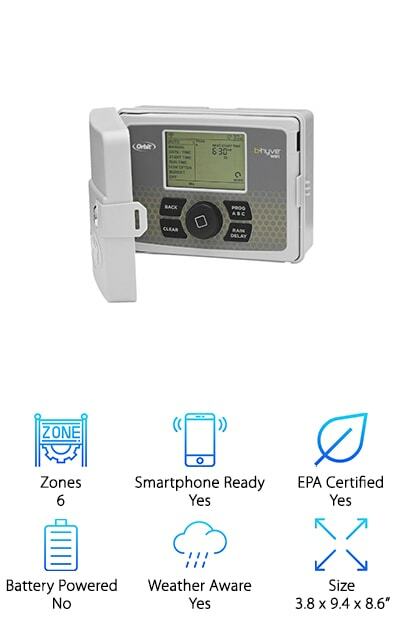 If you’re looking for the best irrigation controller that’s solar powered, look no further than this Netro Smart Sprinkler Controller. First of all, it’s fully automated. You literally don’t have to program a thing. And, because it’s fully automated, it will optimize the perfect watering schedule for 6 different zones in your yard. This cuts down on water use and saves you money. Plus, if you live somewhere that water is being restricted, it will take that into consideration, too. The more you interact with your Netro the more it learns. It can actually make small changes to help you get the most out of your lawn. The remote access allows you to make adjustments from your smartphone or tablet, even when you’re not home. And, as we mentioned, it’s completely solar powered. Next up in our smart irrigation controller reviews is the Blossom 7 Smart Watering Controller. It covers 7 zones but can pretty easily be modified to cover 8 if you need it to. This controller makes sure that your sprinklers are only watering when they need to. How does it work? It uses up-to-the-minute satellite-based weather reports from multiple sources to get the most accurate information. It uses this information to make sure it’s not over or under watering. Not only that but it also takes into consideration the type of grass, trees, and other plants in each area. There are other options, too. You can go with the self-programming option or use the app on your smartphone to set it yourself. It’s user-friendly and makes programming easy. 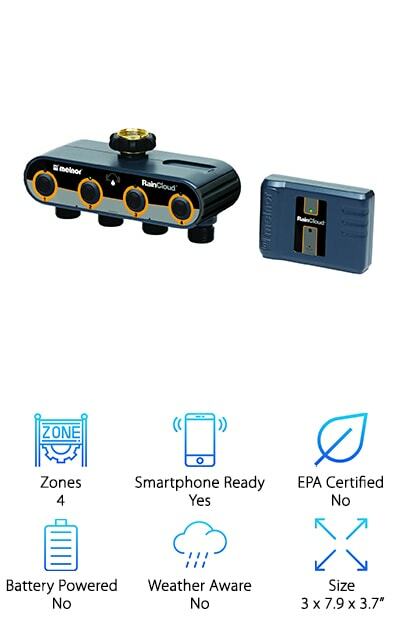 When we were doing our wifi sprinkler controller comparison, we knew we had to include this system from Hunter on our list. 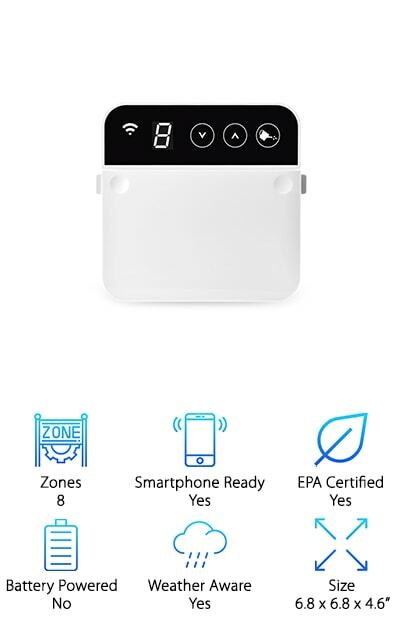 It uses WiFi to get live information from local weather stations so it knows just when to water your lawn and when not to. You’ll save money on your water bill and keep careful track of your water use. 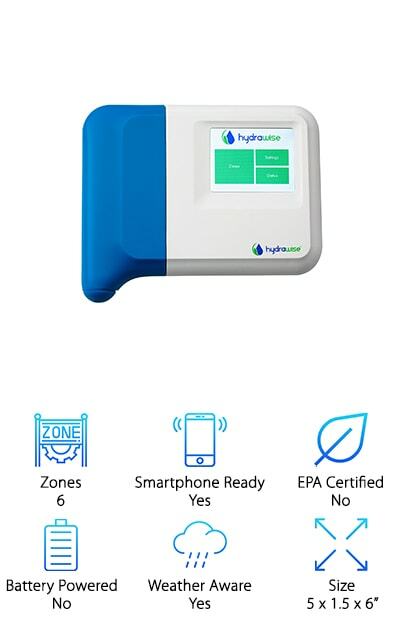 This one does something pretty cool - it has flow meters that can actually help you detect issues in your water system. If you have any broken pipes, broken valves or spray heads or faulty wiring, this Hunter system will alert you to it. It easily wires into your existing sprinkler timer wires. Plus, it uses your router to access the wifi so you don’t need to worry about any extra cables. The RainMachine Mini-8 Controller can cover up to 8 zones and uses real-time weather forecasts. It also updates its information several times a day so it keeps up with any changes in the forecast. This is all to make sure your lawn is getting exactly the amount of water it needs - no more, no less. This is good for the planet and it saves you money on your water bill since your sprinkler system will only be using water when it has to. Something else we really liked is that it’s compatible with Alexa, Google Home, and Nest. That makes it super easy because, for the most part, you can control it only by using your voice. Or, use the smartphone app and make adjustments from anywhere in the world. 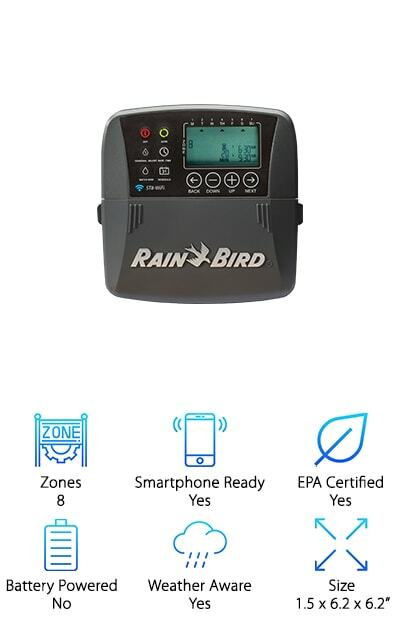 With the Melnor RainCloud Water Controller, you can control your sprinkler anywhere you have access to the internet by using the smartphone app. Or, if you’re at home, it’s also compatible with Alexa so you can even control it using voice commands. This one works a little differently from the other products we reviewed. Rather than using the weather to set the watering cycle, it uses a sensor that actually determines how much moisture is actually in the soil. You can also use this system with a standard gardening hose so there’s no need to dig up your yard to install a complex sprinkler system. This is the perfect choice for someone who wants the benefits of a sprinkler but doesn’t want to go through the mess of having on installed.